7/8" Sterling Silver Portrayal of St. Peter holding the Keys of Heaven. He is the Patron Saint of Fisherman, Masons, Bridge Builders. 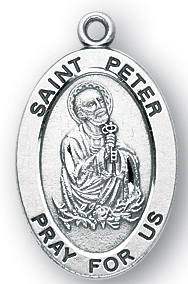 This Sterling Silver Oval Shaped St. Peter Medal is made in the USA. 1 x 7/8-inch solid 14K gold Seven Gifts Medal. Made of solid 14-Karat Gold. Our Catholic jewelry will arrive to you or the recipient in a deluxe jewelry box, ready to wear or give as a gift. This jewelry piece was proudly made in the USA. It features our Satisfaction Guarantee. The back of the medal can be engraved for an extra charge of only $25, up to 3 lines and up to 12 characters on each line. 3/4 x 1/2-inch Sterling Silver St. Thomas More Medal. 3/4 x 1/2-inch 14kt Gold St. Joan of Arc Medal. This Fancy Celtic Cross Pendant available from CatholicShop.com features dimensions of 24 X 16 millimeters, approximately 1-inch by 2/3-inch. Made of 14K Yellow Gold, this religious jewelry piece weighs approximately 1.63 grams. It comes ready to give as a gift in a free deluxe gift box. This Iphone 4/4S- Mixed Saints features our satisfaction guarantee. Imported from Italy. This Irish Coin - Lady of Knock can only be purchased in these bulk lots of 25 units at a discounted wholesale price, which is now available to the public. These discounted bulk packs offer the perfect solution if you want to give these Catholic goods away as gifts or to use as free envangelizing tools. Imported from Italy. 7/8" Sterling Silver Portrayal of St. Paul with a Sword and Book. He is the Patron Saint of Authors, Lay People, Evangelists. This Sterling Silver Oval Shaped St. Paul Medal is made in the USA. Our Cathedral Key Ring Divine Mercy 3-Pack features 3 units for one low price. 2" Divine Mercy Key Ring. Our 14K Gold-Dipped Crucifix Stand from Symbols of Faith measures 2.25"L x 1.25"W and comes in a deluxe gift box. This Sterling Silver Oval Shaped St. Peter Medal has passed our quality control assessment and meets our strict criteria to be a Catholic Shop product. Buy with confidence.